I don’t know about you, but I have a small addiction to ice cream. I want it year round, and I want it in large quantities. And quite frankly, I could live off of chocolate ice cream for the rest of my life (it would probably be a short one if that’s all I was eating, but you know what I mean). Next up in line for my top favorite ice cream is definitely red velvet, and that was what I planned on making last weekend until I realized I didn’t have all the ingredients I needed. Plus, it’s a little heavier than I’d like on a hot summer day so I started brainstorming. What else could I make? The more I thought about it the more I started gravitating toward some sort of vanilla ice cream, but that’s way too plain for me. I wanted something a little more interesting with more pizazz. 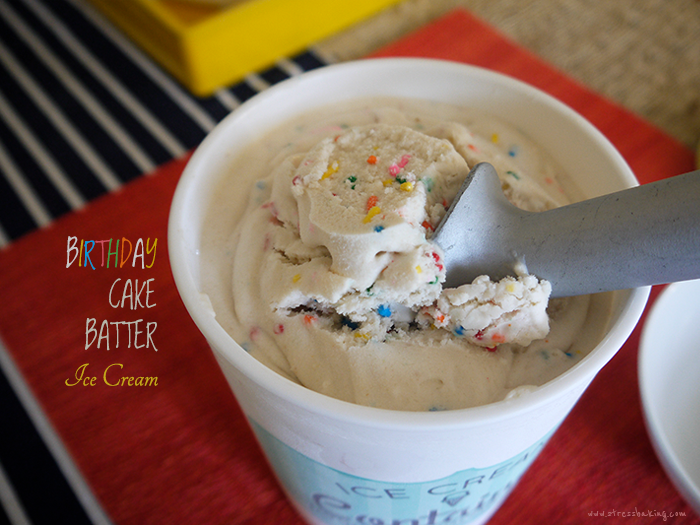 And then it dawned on me – my all time favorite ice cream when I go out is Cold Stone Creamery’s Birthday Cake Remix. So why in the world wouldn’t I try making that at home? It was obvious I felt like I had punched myself in the face. Duh, Leslie. Duh. This ended up being even simpler than I had originally thought – I could just make my Carnival Cupcakes and add a few other ingredients to turn it into creamy, cold deliciousness. No eggs, no real fuss. I recommend having a good amount of sprinkles on hand because I promise you’ll keep thinking you haven’t added enough and keep pouring more in. I see nothing wrong with this and encourage you to add as many brightly colored sprinkles as you see fit. I also recommend these adorable ice cream containers – I picked mine up from Home Goods last year, but I also picked up a couple more in different colors a couple weeks ago so they’re still around and kicking! If you don’t find it at your local Home Goods, you can always order them from Sur la table. 1) In a small bowl, combine flour, 1/2 cup sugar, baking powder, baking soda and salt. Set aside. 2) In a large bowl, combine 1 cup milk and 1/2 cup sugar in a bowl until sugar dissolves. Add 2 teaspoons vanilla extract and heavy cream, stir to combine. 3) Add 3/4 cup of dry mix to the milk mixture and stir until well combined (set aside the remaining dry mix). Place in refrigerator for 30 minutes to thoroughly chill out, man. 4) While the batter is chilling, make the rest of your cake! Preheat oven to 350º F and prepare a 9×13 baking disk with non-stick spray. Set aside. 5) In a large bowl, combine melted butter and 1 cup sugar with a mixer on the lowest speed. Add egg, 3/4 cup milk, and 2 teaspoons vanilla until well combined. 6) Add in the leftover dry mixture and combine with a mixer on the lowest speed until batter is lump free. Now pour in 1/2 cup sprinkles and stir gently by hand to fold them into the batter. 7) Pour batter into prepared pan and bake for 15-20 minutes or until a toothpick inserted into the center comes out clean. Let cool in pan for a couple minutes and then transfer to a wire rack and allow it to cool completely. Once cooled, rip it to shreds! No, really. Let any aggression you have built up out on the cake and rip it into small pieces (each piece smaller than a penny). Set aside. 8) Remove chilled batter from fridge and pour mixture into your ice cream maker and allow it to churn for 25-30 minutes. During the last five minutes of the churning process, add in your ripped up cake pieces and remaining sprinkles. Once it’s done churning, transfer to a freezer-safe storage container (I highly recommend mine that I got at Home Goods – they’re the best!) and freeze for at least 3 hours. It will be soft serve-esque just after it’s done churning, so if you want to rock some soft serve ice cream action just throw it in a piping bag and cut off a large whole in the corner and squeeze into an ice cream cone. Yum! Otherwise, let it chill overnight and by the next day you’ll have ice cream of the perfect consistency. Enjoy!